I'll be doing most updates to this page during the weekend, so please be patient. I'll group you by state so maybe you can find a buddy! Participants in red have completed their zine! Underlined names are links to gallery pages. personal challenge: To not worry if I don't sound personal enough and just to keep writing until I pass out. All the artwork and photography must be by me and only me! personal challenge: my goal is to have is be really honest. personal challenge: i tend to write peices over & over again- worrying if they sound good enough. with this zine i want to truly be as raw as i can and do as little re-writing as possible. i'd also like to include more of my own illustrations, which are horrific, but who cares, ya know? personal challenge: to actually make a zine, considering i haven't done one in four years! personal challenge: To do all the artwork myself. No clip-art or stuff from magazines or even work done my friends. All the drawings and photographs have to be done by me. size: I don't know the zine-size yet, I think that'll be something I decide last minute. Personal challenge: All I know, is I want to write an honest zine full of the secrets I keep. personal challenge: to get real with myself about how living with illnesses and disabilities makes me feel. to write those feelings down. to make art! 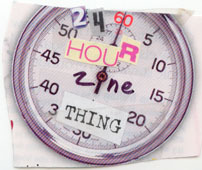 personal challenge: A 24 page, quarter-sized zine of substance! poets, illustrators, photographers, writers, journalists, etc.